Snow might be the key ingredient in a winter wonderland, but it is also a prime culprit in seasonal headaches. It is hard to believe that shovelling snow is at the top of anyone’s list of favourite things to do. It isn’t popular, but it must be done. 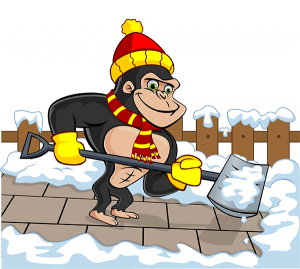 Whether the snow around your property is too great to manage, or you just do not want to, there is always a Gorilla willing to lend a hand. Our Wetaskiwin snow removal and salting service keeps your property clean and passable, so you don’t have to! Dealing with winter in Canada can be tough because it is constantly changing! You might not expect a large dumping of snow or freshly formed ice but you might get it anyway! Instead of letting these things catch you by surprise, let our Gorillas plan ahead for you. Our Gorillas set ourselves apart by keeping ahead of incoming weather patterns and preparing to save our clients from a bad situation. Most heavy snow falls do their worst during the late night and early morning hours. In order to help our clients get their beauty sleep, Gorillas arrive on scene and begin to work quietly. Don’t worry though, you will always be able to recognize our team by our brightly coloured vehicles and uniforms. Each property in your neighbourhood is going to require a different method for handling snowfall and ice. What works for your neighbours won’t necessarily work for you and that is why our Wetaskiwin snow removal and salting can be made to fit your property and its needs. For single dwelling properties, something as simp as a shovel might be enough to do the trick. When dealing with multi-unit properties, our Gorillas are equipped with snowblowers and areas as large as parking lots can be handled with ploughs. While our Gorillas are scraping away your snow, they are equipped to get rid of ice as well. Ice around your walkways, driveways and sidewalks can mean big problems for your guests and clients. Why risk a sprained ankle, broken wrist or other injuries when our Gorillas can give you a safe and welcoming property?